This article first appeared in ‘The Shavian’ in Spring 2018 and is reproduced with kind permission from the author and the Shaw Society. 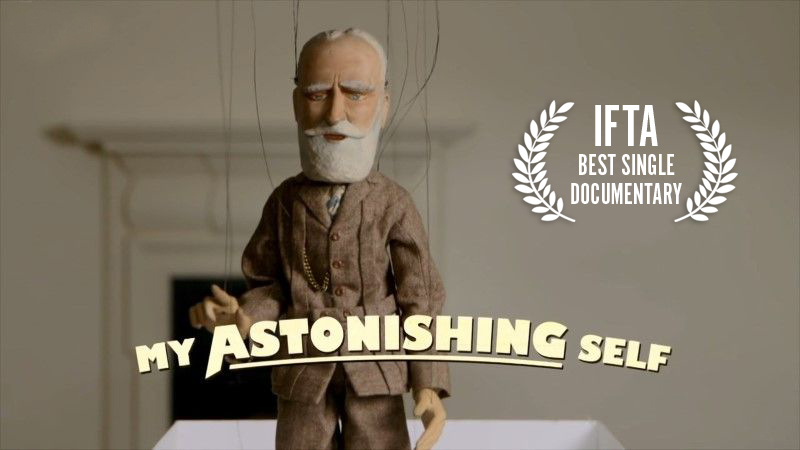 BBC recently aired the documentary ‘My Astonishing Self’ on the life and work of George Bernard Shaw. Produced by Animo Television and directed by Gerry Hoban, the documentary was presented by Internationally-renowned Irish actor Gabriel Byrne. 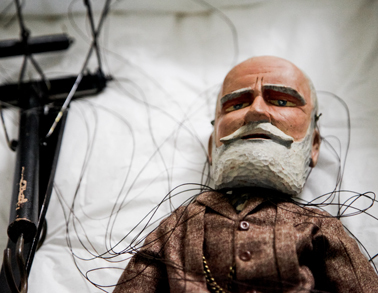 Of special interest to many Shaw fans was the appearance of a charming marionette of Shaw himself. The puppet appeared in a series of short vignettes sprinkled throughout the documentary and was filmed on location at Shaw’s Corner, Ayot St Lawrence; the home of George Bernard Shaw. In 1949 Shaw wrote a short play titled Shakes Vs Shav for the Lanchester Marionette Company in Malvern. The puppet of Shaw was created as part of a troupe of six marionettes; Shaw, Shakespeare, Macbeth, Rob Roy, Captain Shotover and Ellie Dunn. 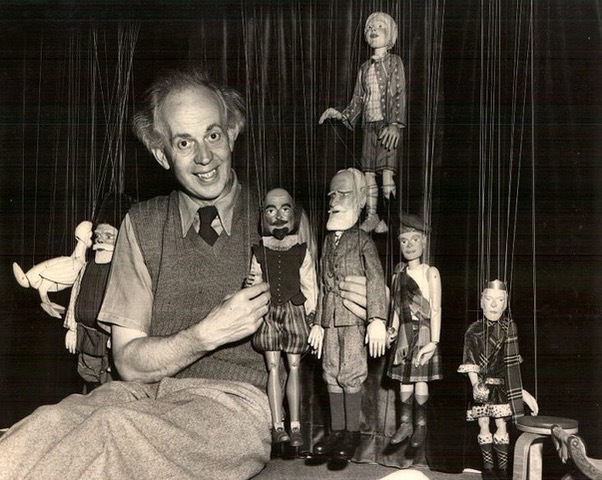 Master puppet builder Waldo Lanchester carved the puppets, the heads were produced by Jack Whitehead, and costumes made by Muriel Lanchester. The puppet featured in the documentary was Lanchester’s original 70 year old marionette. ‘When I did the recce at Shaw’s Corner, Sue Morgan, the National Trust House Manager at Shaw’s house, took down this big old box and showed me the original Shaw Puppet,’ says director Gerry Hoban. ‘It is really magical when you see it and this is where I got the idea of opening the box and revealing the puppet to Gabriel for the first time on camera’. In researching the play Hoban discovered that the puppet of Shakespeare still existed at the Shakespeare Museum in Stratford on Avon. He toyed with the idea of reuniting the two puppets once more; a story he says is almost worthy of its own film, but ultimately the director felt that it would take up too much time and would not work within the running time of ‘My Astonishing Self’. However, he was smitten with the puppet and determined to feature it in some way. The director then contacted Caboom; an Irish company working with puppetry and animation, to explore how the original puppet might be brought back to life. The team was intrigued at the prospect of working with the original Lanchester puppet. Lanchester marionettes are incredible works of art and the idea of bringing Waldo’s puppet of Shaw to life for television was unbelievably exciting. But the condition of the puppet had to be assessed as it was feared it may not be fit for purpose considering its age. A trip to Ayot St Lawrence was arranged to visit the puppet. When you first see it you are immediately taken by the quality and detailed tailoring of his miniature clothing. The contrast between the texture of the fabric and the carved wood of the face and body was going to look amazing on the screen. There were concerns however that the puppet strings, which were the original strings, might need some reinforcement in order to ensure that they wouldn’t snap during filming. To do this the team turned to collaborator Darryl Worbey – an experienced puppet builder and marionette performer. Worbey attached ‘invisible’ thread alongside some of the original strings to ensure the puppet was well supported during the shoot. ‘I had the pleasure of meeting Muriel Lanchester in the early 1980’s at a festival in Stratford Upon Avon’, Worbey recalls. ‘She was very supportive of my early work as a puppeteer, and so to be invited many years later to operate their portrait marionette of Shaw, filmed in his actual home was a very special experience indeed. The puppet was a pleasure to work with; such a finely honed piece of traditional, fine craftsmanship’. Puppeteer Judy Preece assisted with the manipulation. Hoban’s vision was simple. He wanted to film the puppet at various locations around the house. ‘It is like his ghost or spirit; still occupying the space’ he says. ‘I think the puppet has real emotional resonance, and the audiences loved it,’ says Hoban. ‘I agonised over whether it was going to be ‘twee’ and ‘cheesy’ but our producer Martha Maloney and editor Iseult Howlett persuaded me otherwise. And they were right’. The Shaw puppet is now housed at the George Bernard Shaw Museum, Shaw’s Corner at Ayot St Lawrence, the Shakespeare puppet is in the Shakespeare Birthplace Trust and the other four puppets – Macbeth, Rob Roy, Captain Shotover and Ellie Dunn – are in the Staffordshire County Museum at Shugborough Hall. ‘My Astonishing Self’ won the Irish Film & Television Academy Award for Best Single Documentary.